When you like to travel a lot, or if you have to travel for work, it’s nice to know that you’re able to take your pet with you. With the Argo by Teafco Petagon airline approved pet carrier, you won’t have to worry about whether your pet will be allowed on board with you. More and more airlines are allowing pets on board these days because they know that more people just won’t travel without their pet. Gone are the days where you had to put your dog in a kennel when you had to travel. Of course, besides just being able to get on the plane, your pet has to be safe and comfortable, as well. 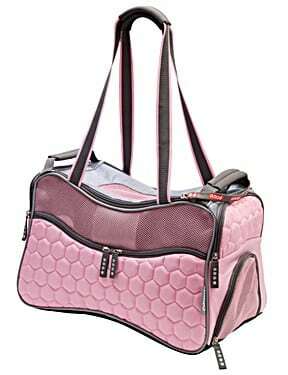 This designer dog carrier provides the safety, security, and comfort that they need. In this review, we will tell you everything you need to know before making the decision to buy. We will tell you the measurements, the good points as well as the bad, and we even talk about the customer reviews that it is getting. If you want to buy this product at the best price, just click on the link displayed below. CLICK HERE to Find Out What Owners are Saying & Check the Pricing on Amazon! 1.5 What Are the Advantages & Disadvantages? This carrier was made mostly for very small dogs and puppies. The recommended weight limit is up to 15 pounds, but the best way to tell if your fur-baby will be comfortable in it is to measure them, to make sure that they will fit comfortably. While a 15 pound Chihuahua may be very comfortable in it, a 10-pound Dachshund probably wouldn’t. That’s only because the length of the dog breeds differ. Another airline-approved carrier is the Sherpa Tote Around Town Pet Carrier. It is very sturdy, yet lightweight. It also fits under the airplane seat with no problems at all. It has 5 external pockets, each has zipper closures. This is a plus, because many carriers have Velcro closures, and aren’t as secure. You can keep treats, small toys, ‘doggie bags’, medicines, and other things that you want to take with you. The opening is on the top. 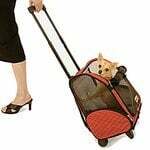 It has a double zippered top that makes it easier for you to make sure that your pet doesn’t get out, while on the airplane. It has dual mesh windows, also. These not only provide good ventilation, but they also help to keep the carrier standing upright. Some carriers don’t have the ability to stand on their own because the mesh isn’t strong enough to support the sides properly. For when you’re in the car, this carrier has a smart strap that allows you to easily slide a seatbelt through. It is so much better than having to try to manipulate the seatbelt on and around the carrier to keep your pet safe. It also has a water-resistant pad that is easily removable for cleaning. CLICK HERE to Buy this Airline Approved Carrier on Amazon! Remember that any time you are looking to buy a pet carrier, it is important that they not only are lower than the recommended weight but that they are smaller than the inside dimensions. The only measurements for this bag are 17.8 x 9.5 x 11 inches. We would suggest that you use these as the outside measurements, just to be sure. Take about an inch or so off of the measurements above, just to be sure that your pet is comfortable as well as safe. If you need a bigger pet carrier, take a look at our review for the Aspen Pet Pet Porter Plastic Kennel. It is airline approved, also. It is a hard-sided carrier, but the sizes range from 10 pounds up to 90 pounds. There are also different colors to choose from. Airline approved pet carrier, meeting strict IATA requirements. Pet owners who are using this carrier are very pleased with it. Their pet is comfortable and safe, and the sides don’t cave in like some other soft-sided carriers do. They like how easy it is to get their pet in and out of it, the security it has, and the sturdy padded bottom. They also like the fact that there are a lot of zippered storage pockets around the bag. This way, they can carry things that they need, and not have to worry about them accidentally falling out. It is fashionable, and can actually be used as a tote carrier. It is an exceptionally good value, given the durability, added safety, and functionality that this pet carrier has to offer. 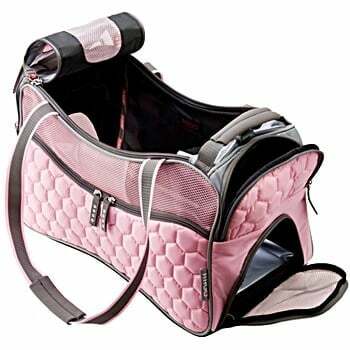 CLICK HERE to Buy the Argo by Teafco Pet Carrier on Amazon! What’s the Best Over the Shoulder Pet Carrier?